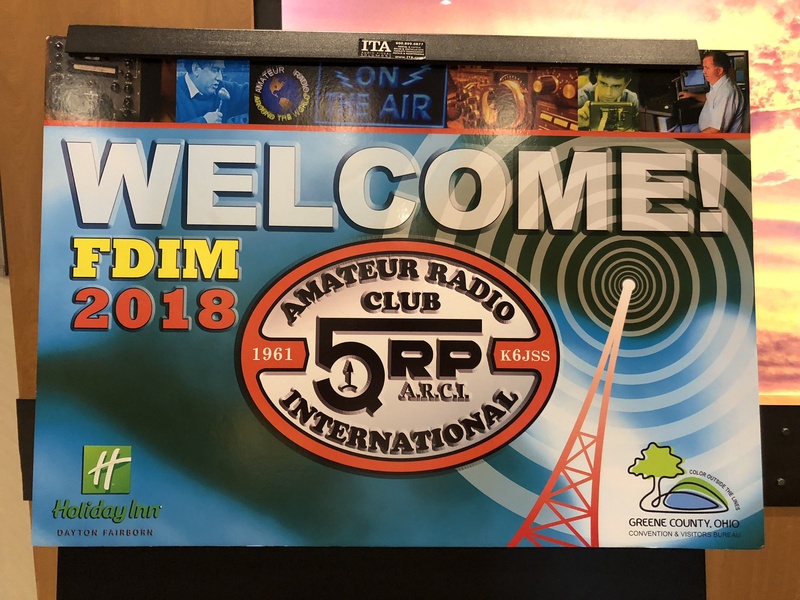 2018 Hamvention and FDIM are Over! 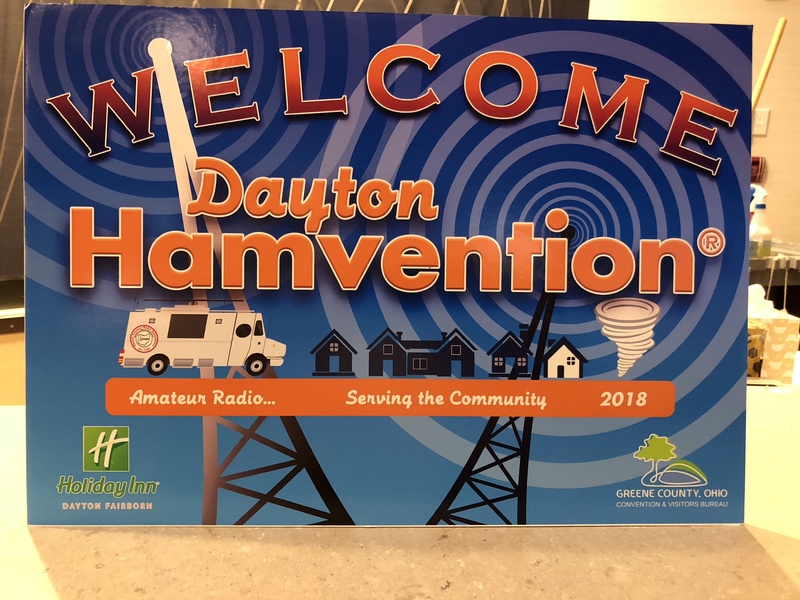 Yes, our 2018 trip to Dayton Hamvention and QRP-ARCI Four Days in May is over! It was a GREAT trip! “This is not my award. I am honored to accept this award on behalf of the thousands of dedicated members of SKCC, and most importantly, those few members that make the activities and awards possible for hams all over the world. Morse code is the universal language – CW, TU, SK all mean the acme no matter the culture or country. It is one of the binding common threads of Amateurs across the globe. 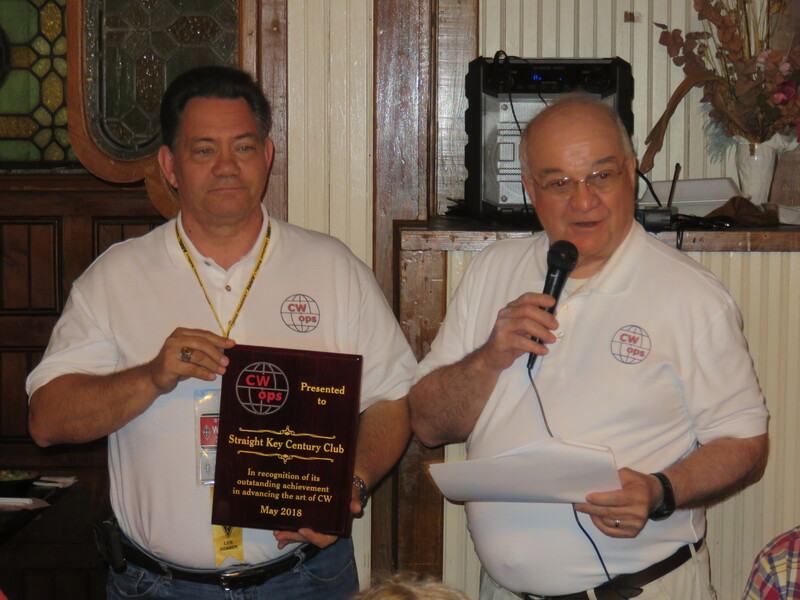 It is my honor to accept this award on behalf of SKCC, one of the premier international clubs that support and perpetuate the continuing use of Morse code using one of the basics of ham radio, a straight key. Sincere thanks to CWOps for this award”. The dinner was great – we bought some raffle tickets for a drawing on Saturday, but neither of us won anything. After dinner, we attended the FDIM Vendor Night at the Holiday Inn in Fairborn. Saw lots of folks, visited and bought a few minor items. 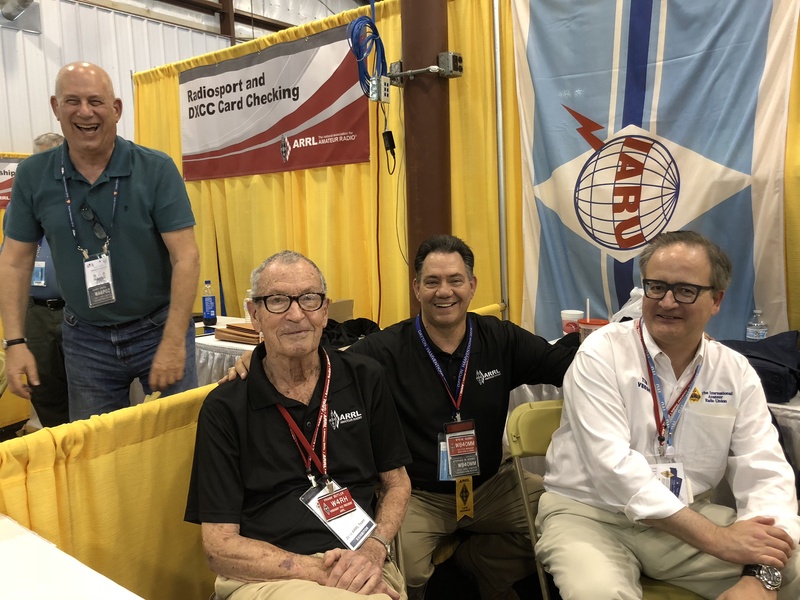 Early Friday morning, we arrived at Hamvention, where I worked in the ARRL RadioSport booth primarily QSL Award Card Checking and answering questions about Logbook of the World (LoTW) and various awards. 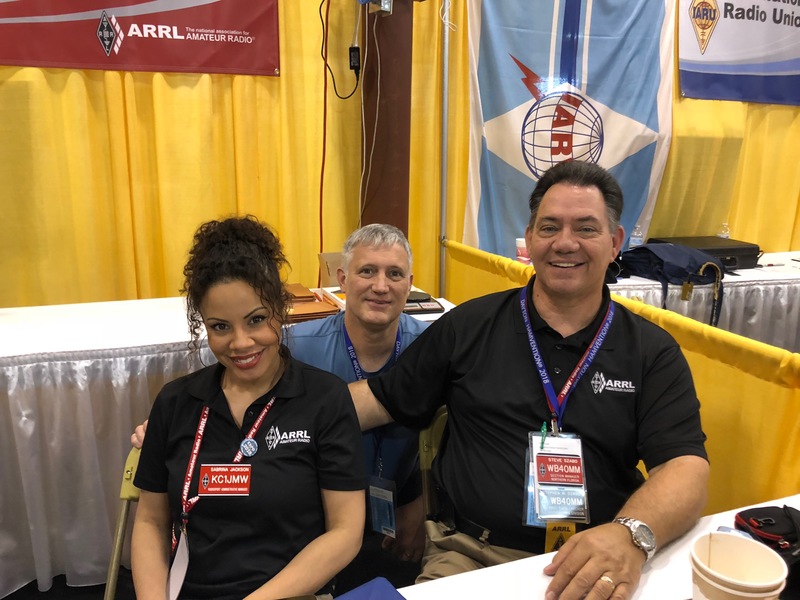 I helped ARRL Staffer Sabrina Jackson, KC1MJW – who just got her license in April – and I had the honor of becoming her first QSO!! (2M FM). A QSL will be on the way once I get home……Sabrina was a terrific partner both days (Fri and Sat); pleasant, knowledgeable, and just a wonderful person! It was nice to work with her. Here is Sabrina, my brother John and I in the booth Saturday afternoon. 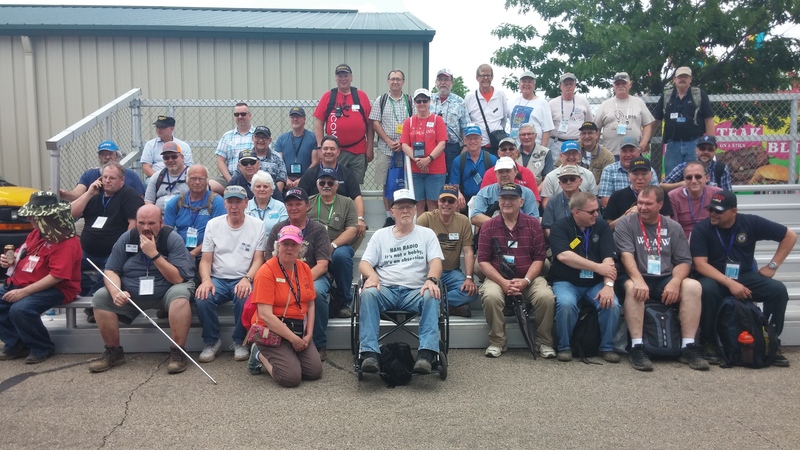 Here’s the ARRL Staff Photo at Hamvention 2018: That’s me in the back row on the left side! Glad I’m kinda tall! Friday night we had dinner the folks from Orlando Amateur Radio Club (John, Mike, Bob, and Val) – I wish I would have remembered to get a photo! It was a great dinner, and we talked and laughed for hours. They are top-shelf folks and we were both honored to get the invite to join them. The fella on the left laughing so hard is Gerry Gross WA6POZ who was card checking in the booth with me – he’s howling, because as we had this photo taken, he was doing “rabbit ears” behind Frank and we kept telling him to stop! He’s a hoot! He’s also dedicated and dependable! Always ready to help with the card checking. 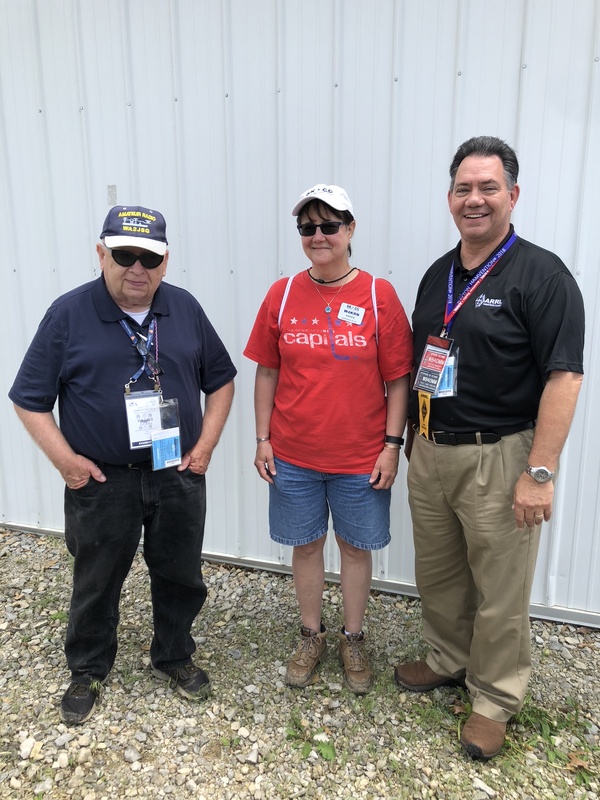 I was also able to get a “Special Photo” with my good SKCC/NAQCC friends Karen W4KRN and Curt WA2JPG – these two regularly work me during various sprints, contests, parkpeditions and whatever. They are great “ham friends”. It’s always nice to see them in person! I was glad we could get this special photo. I purchased some minor stuff again, and John did too – our best “mutual” purchase was a LASER engraved Yeti Cup with the Dayton 2018 Hamvention logo on them along with our call signs – they are beautiful! We kept checking for a door prize, but neither of our numbers ever came up. I’m writing this in a hotel room in Cleveland, TN on the way home. Another great trip. John was a great traveling companion – we listened to lotsa really loud music (my new Rogue has the BOSE sound system! ), laughed a lot, and had a ball. I hope to get my brother George into one of these future trips. I know it would be a hoot! 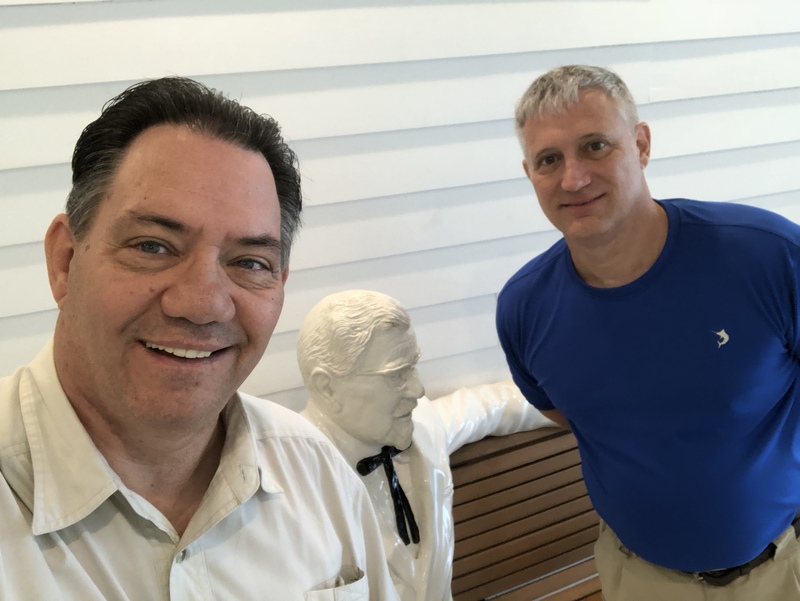 And as a final aside to the adventure, here’s a photo of John and I with Kentucky’s Most Famous Person – Col. Harland Sanders, of KFC fame in his original restaurant in Corbin, KY. Ya’ just can’t make this stuff up!